Chicken Originally uploaded by wjharrison77. My seniors were doing some peer assessment of their travel writing today. They just started to write yesterday after a week of reading articles by, among others, Paul Theroux (my favourite) and Bill Bryson (far from a favourite). The class loved Bryson and hated Theroux. Boooo, I said. Booooooo! • Some people say the town is a fading glory. Many go as far as to call it tacky. But to me it’s simply brilliant. From the pleasure beach to the tower, the sandy beach to the hoards of tourists; I love Blackpool! The one o’clock cannon goes off and 3,000 people have a near heart attack. The odd couple worriedly wonder where the cannonball goes. • Being a tcheuchter, I obviously cannot comment on the modern ways of the lowlander. With their new fangled televisions and four-wheeled cars us Highlanders don’t have a hope in hell of understanding how they live. Or so they’d have us believe! Dinner last night was very low maintenance and very good. • Season the chicken well. 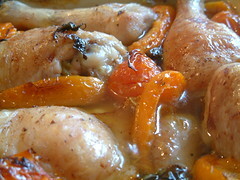 • Put the first 6 ingredients into a tight fitting oven proof dish and drizzle with the olive oil. • Cover with tin foil and put in the oven for an hour. • Remove tinfoil and cook at 200oC for another 20-30 mins, until browned. We ate this with some super healthy steamed green beans and some highly unhealthy garlic bread. Dinner sounds wonderful and I’m very impressed by the quality of your students’ writing! I was just looking at the flicker photos in your sidebar and that puppy is absolutely gorgeous! What breed is he? He’s a working cocker spaniel. They are slightly different from the show cockers: a less curly coat and a flatter head. Chilli pepper and tomatoes is good for summer season! it can increase my appetite. The first extract made my mind warm. The secound one is One O’clock Gun, isn’t it? Oh! your students are great. Your chicken looks lovely! (Isn’t it just wild how we describe food sometimes!) I almost thought those were apricots at first, but now I know they are peppers. Your garden is wonderful. In one of our homes of the past, I built a raised garden also. It is amazing what you can fit into them. And plus, all the goodies you are growing. Are you checking out the gardening sites on the web? I enjoy them, but it does take some time to read all of them. Thank you also for sharing the works of your students. I really am enjoying them!